Simon Turney is a born and bred Yorkshireman with a love of the country. A love of travel and classical history have shaped the author’s writing. After several attempts at short stories, Simon turned to full length Roman novels in 2003. Since then his historical fiction novels have gone from strength to strength. Julius Caesar is a man whose ambition knows no bounds and Marcus Falerius Fronto, commander of the 10th Legion, career soldier and companion of the general for ten years, knows it all too well. 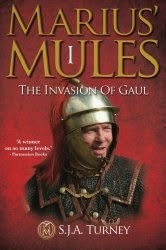 Caesar has assembled an army in northern Italy, his target Gaul, a country Rome has been at peace with for years. But Caesar’s desire for greatness and revenge drives him to engineer a war with the Celtic tribes that inhabit the region, no matter what it costs his men. The Marius series has been on my radar for a while and, on the strength of this novel, so will the rest of the collection be. Before going on I have a confession – I like novels set in the Roman period and I write them too, so it takes quite a lot to impress me. So what sets this novel apart? After all, there have been masses of books written about Caesar. Well first is Caesar, whilst being central, he isn’t. Yes, he’s the hub around which the main characters (e.g. Fronto) revolve. He is an incredibly well known historical figure at the end of the day, but Turney doesn’t allow him to dominate. In fact it is the other figures that really drive the action along. Caesar provides the events, Fronto and his colleagues provide the detail, the activity, the personal touch. Another aspect I appreciated was that often it was Caesar’s generals that made quite significant tactical decisions (and mistakes) that determined whether a battle was a success or a failure. In other words the great man wasn’t the omnipotent being portrayed in other stories. Third, and critically, Turney has spent a significant amount of time on research. The battle scenes are very, very well drawn – they are compelling, believable and feel accurate. Caesar himself is portrayed as self-serving and brutal. Fronto, although admiring the man, does not trust him. So there are other human elements at play here beyond the simple aspect of ‘go and kill the enemy’. For example at the beginning of each chapter are two or three Latin words or phrases with an explanation as to what they mean, usually related to subsequent events. It adds colour to the narrative without long, drawn out and distracting explanations. In summary this is an intelligent, well researched historical fiction novel that stands head and shoulders above the run of the mill tales of this type. Anyone with an enjoyment of this period should look at Marius’ Mules. Thank you for the review -- but you and Big Al need to stop reviewing historical fiction. Between Al's review of the Romans vs Brits, and this one of the Romans vs Gauls (both eras my husband loves) - you've lightened our pockets a bit recently. (joking). Thank you for reading and providing the review.